This is my most important item on my to-do list. We definitely want to increase our savings before I make the switch. We want to be prepared just in case there is an absolutely horrible month of income. I would also like to have very limited debt, or just no high interest debt. I'm fine with saving the money and not paying it off if the interest rate is 0%. Luckily right now our income is high and our expenses are relatively low. If I will be self-employed and W will be mostly commission at his job, then a new budget needs to be created. Every month will most likely have a much different income level and this all needs to be thought about. We definitely want to continue to live on less than half of our income as well. I don't want us to feel like we are struggling because we are stressed about not having any stable income. 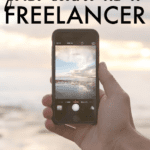 It is important to build up your freelancing before you decide to leave your day job. Of course this doesn't always work perfectly for everyone, but this is how I'm approaching self-employment. 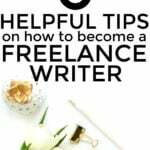 I have a number in my head for where I would like to be with my freelancing income per month, and I would most definitely prefer to reach that before I make the switch. I want to build up clients/customers to a point where I 100% believe that I can be successful as a self-employed person. Health insurance will be very expensive, but luckily I'll be able to hop onto W's plan once we get married. Also, health insurance can vary widely. You can get a very cheap plan that pretty much will only be helpful when you are near death and after paying large fees, or you can get something more expensive that will require you to pay less when you visit the doctor. For me (if I have to pay for my own insurance), since I am still young and never go to the doctor, I will most likely go for something on the cheaper side for monthly payments, and save a heck of a lot of money for any fees and co-payments in a separate medical fund. For me, luckily I don't need a lot of expensive machines to do my work. Just a computer and I will be fine. However, before I make the switch, I definitely need to upgrade to a better computer. The one I currently have is becoming more slow each day, and that is just not efficient when you are self-employed. I would also like to work on furnishing my own office area. Right now, I just work wherever. This doesn't have to apply to everyone. However, for me, I would like to be as diversified as I can. This way, if something decreases with one of my jobs, then I will have other areas to fall back on. I am working on adding more side hustles all the time, and the other day added blog management to my list. I know that most of my work is related to blogs, so I am looking for additional areas as well to expand in. What do YOU do for work? Taxes – Don't forget about these! Many of you have asked me if I'm paying taxes. OF COURSE I am paying taxes. I should probably make a post on this as many of you have had questions about self-employment taxes. I am still new to paying these (outside of what I pay at my office job), as I just started working on my side hustles last year. It is no fun to have to pay them but it needs to be done. Taxes are paid quarterly and they are expensive. Taxes need to be put into our budget as well, and I want to budget on the high side so that there are absolutely no surprises. It's no secret, we are looking for a new house. We plan on buying sooner rather than later (before I make the switch), as I don't have 2 full years of self-employment on the books. I would hate to make the switch and then not be able to get a home since neither of us have stable income. I know it is possible to get a home, but I'd rather get the best interest rate and also for the home buying process to be as easy as possible (just like the first time we bought a house). What else am I missing for those who want to make the switch? Would you ever make the switch to self-employment? Good luck! Sounds like you have all the bases covered, and with your education and work experience in finance, I'm sure you'll succeed. It looks like you have most things covered. One thing I would do that could be added to the list is a review of all big ticket items. Are there any home repairs that are needed, is my vehicle in great condition, are there any household items that need to be replaced (fridge, washer, dryer, etc). I only mention this as you stated, credit will be harder to come by. Essentially its just trying to minimise any big financial surprises that are more common than not. Thanks! And I agree with your list. Luckily we both have new cars and are currently working on fixing up our house. I can't think of anything you are missing. Good luck to you, I'm sure you will do great. Thanks! And yes I deal with taxes nearly everyday, so thankfully nothing is too surprising here. In reference to health insurance, if you were unable to get it through W you would be able to sign up for insurance through the health care exchange in your State next year. You probably wouldn't qualify for any subsidies (okay I know you won't based on the income you post!) but it still should be "reasonably" priced. Good to know DC! Thanks. I'm new to your blog and I absolutely LOVE it! All of your posts are so encouraging, so thank you. I do have a question. 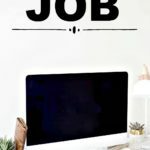 WHEN you take the plunge to becoming solely self-employed, do you plan to continue spending about 40 hours/a week on your current side hustles, or will try to increase those to make up for the FT job hours you will no longer have? I wasn't sure if your main goal of leaving the job was to have more time to enjoy life, or to better manage your time by trying to use those hours making MORE money at home? Or perhaps a little of both? Thanks in advance! And I don't know if I will increase my time spent on self-employment, unless I have to. Right now I'm probably working 80 hours a week, and I don't think that's sustainable. My goal is to be able to work from home and lower my expenses (by cooking from scratch and such) and focus on improving my life overall. I don't know if I'd ever make the switch unless I actually started up a brick and mortar business doing something I love. I'm not sure freelancing is in the cards for me although I haven't given it a fair shot so I can't say. I think it's great you know what you want Michelle and go for it if that makes you happy. My mum told me when I moved to Canada, go where your heart takes you and I say the same to anyone else, go where your heart takes you. Keep up the good work. Thanks! And this is why I want to make sure that we are ready and prepared for it as much as possible. Self-employment, especially in the online world, is not stable, so I definitely want to have at least a couple of years of expenses saved up. The first thing on my husband's to-do list is to talk to a lawyer about incorporating into an LLC. Limited liability for the win! Maybe not as important when you're a freelance writer/blogger as when you're an engineering consultant though. I formed an LLC already. Luckily I work in business valuation and deal with LLCs and small businesses everyday so I know how everything works. That's cool. We're still figuring things out. My recent post Is it better to have loved and lost or to have never loved at all? Diversify is a big one, make sure you have diverse revenue streams. I dont know how much traffic you rely on from google or how much you just get because of your awesomeness… 🙂 but if they it is stripped away and you are left with other revenue streams are you going to be able to sustain yourself. I was just looking at your income reports. 670 last may and over 7600 this may, way to go michelle you are rocking it….good job!!!! Thanks Christopher! And yes I definitely want to diversify. A LOT of my traffic is referral traffic. I had the choice between some kind of LLC and just adding the freelance income to my tax return, the later being easier to do and undo so I opted for that. With more business expenses I am thinking about switching now. My recent post Retirement? What retirement? I have an LLC for my freelancing. Luckily it doesn't cost too much to do that in Missouri. So this means you will wait more than a year until you are married and have purchased the next house? That seems like a long time but it would be prudent to get that health insurance and loan! Ummm it depends. If we find a house this year, then we will be buying this year. We just haven't found the perfect house yet. I'm giving myself at least 6 months before I make the switch though. I'm not too worried about health insurance, and would just buy the cheapest plan if I had to do so. The last point is really important to consider. When J and I went to buy a house, we couldn't do it originally because he was self employed. And I had a steady income! We bought one when he got a job. 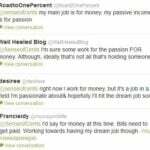 My recent post Do You Have an Income Problem? Or a Cash Flow Problem? I agree Daisy! This is something that we are really thinking about. After reading this post, I'm not worried at all about you making the switch to self-employment smart Michelle 😉 You have all your bases covered. Awesome! Very thorough planning, nice work. I'd love to hear some details of your health insurance search if you're not able to immediately hop onto W's plan. One thing to look into would be a high-deductible plan with a Health Savings Account (HSA). It should be lower cost up front and your contributions into the HSA would be tax-deferred and then tax-free if used on healthcare. If you never spend it on healthcare, your money just stays in the account year after year and you could eventually use it as additional retirement savings. I'm not sure of the logistics if you eventually switch to W's plan though, so that would definitely be a question. Look forward to hearing more! Thanks Matt! I will definitely talk about this more when the time comes. Well thought out! I did the same before I went full time with my business and blog. My wife has insurance so the family is covered through her and savings and emergency funds were carefully planned. We decided to buy a home before I left my stable job since interest rates are so low and it would be difficult to get the home with just my wife's income. Diversifying is key but is there anything else you really want to add? After awhile you could feel like you are being pulled in every direction. And yeah I don't want to diversify too TOO much, but just enough so that I am comfortable. It looks like you have most of it covered. One thing I would add is incorporating your business and deciding on what kind of business accounts you want. In regards to insurance, I was actually surprised at how little we had to spend for ours. Our plan is about $40 per month than what I had through my last employer which is not bad at all…especially for a family of 5. I was expecting much worse than that. And $40 more is great! Hi Michelle, you are an inspiring young woman. It's refreshing to see how well you are planning, that's a big departure from what I hear from callers dialing in to Dave Ramsey's radio show! I have always wanted to be my own boss but it wasn't until I spent years recovering from my horrid money-management skills and built a decent asset base that I could be brave enough to make the plunge. Unlike you, I didn't take the leap with an established income from "side hustles." Instead, I eliminated all debt including my mortgage, got my retirement nest egg to a decent level and saved up a hunk of cash to last me a year without income. So, here I am working on my own terms with the goal to help others and earn a living doing so. While I'm not earning yet…I love what I'm doing and never want to stop! And that's awesome that you love what you're doing. That's what is important to me. Sounds like you've thought of all the possible difficulties and already have plans to work around them. 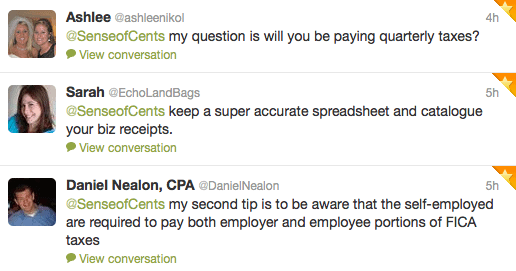 I'm looking forward to learning more about how you're staying organized for taxes from a self-employed perspective. That's something Leslie and I need to learn a lot about before we make the leap into complete self employment. And ugh staying organized is not a good quality of mine. Haha it takes a lot of work! I would say the biggest think is actually live off your side hustle money right now for a period of time. If you aren't willing to do that because of your wedding, or fixing your house, or this or that, then you aren't ready for self-employment. 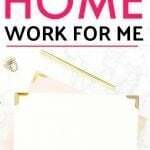 You currently make a lot in extra income, but I'm sure that's a ton of money when you add it with your full time work. So that means no matter what, your income will take a hit when you go to self-employment. Quite honestly if it weren't for the dry months and sucky income I've had, I'd love self-employment. We live on way less than my side hustles income. Less than $3,500 a month altogether thankfully. And I'm glad that you said that you would still love self-employment if it weren't for dry months. I think you're definitely on the right track with everything. I think if you really want to have a new house, maybe try and get that done before you quit your day job, otherwise you might end up with a much higher interest rate otherwise. If I'm remembering right, crystal from bitfs paid about 1% more than current market rates when they got their new house last year and had all sorts I hurdles because of te self employment. Thanks! And yeah we definitely plan on buying the new house while I still have a job. Sounds like you've thought of pretty much everything – good for you for considering health insurance. I think other things to consider is how you'll keep socially connected and be sure to get out of the house! Thanks! And yes we want a house that will be good for self employment also. I don't want to be bored out of my mind. Congrats! I think the biggest thing for me (I only lasted 2 months of boredom) was not having something to do at every minute of the day. Schedules are really important, even if you're filling them with non-work related things. Having that structure makes actually working a lot easier. Thanks for stopping by Daniel! And I didn't know that you made the switch at one point in time. Did you go back to your old job? Sounds like you've thought about this a lot and have a good plan in place. It's important that you get the boat as close to the dock as possible before jumping on and you're ensuring that this is the case. One thing to consider with your budget is how much you spend on utilities. I know it may not be a big change, but I've heard it can raise them by quite a bit if you're now going to be home full-time. Thanks Jake! And that is a good thing to think about with the utilities. Thanks! Spread your clients but that's easy to say. It really depends on the type of work. Housing is an analogy. So people build houses and once they are sold, they get a shed load of money then move on to another house. Other trades are like plumbers or painters and decorators – they may have customers but most people don't redo their house every year – every 10 more like it. Others are like window cleaners or gardeners – regular work at a lower rewards but it is steady.. So you always need side hustles from completely different areas to build the savings and insure against a rainy day. Looks like you've got it covered anyway. My recent post Your Money Is Important, Let’s Make Sure No One Else Spends It! i am making the switch too. all of your posts are so incredibly helpful. THANK YOU! WOHOOO! What do you plan on doing in self-employment? This list looks great! You're two years ahead of me as I would love to work for myself as well. Thanks for providing such well thought out and pointed concerns, etc. I'm so excited for you! I don't know that I'd ever want to leave my career 100% but I would love to only ''work'' 1-2days/week just to keep my skills up. I think you've got everything covered and you do have a wicked degree to fall back on if it doens't work out but I don't see that happening 🙂 Also I need a new computer BAD…I'm using my husbands old laptop, it's like 6yrs old and occasionally smokes haha. Thanks Catherine! haha that's probably not good that it smokes! Good luck! I think if you're looking to get a new house soon I would put off leaving your job till you have that wrapped up. It will just make the whole process so much easier. Other than that it sounds like you've got a good handle on what it will take and the hurdles you might face. I look forward to following your progress! Yup I agree about the house! We will definitely be buying before I make any switch. Sounds like you have a strong plan in place! Good luck on making the jump! Taxes sound quite complicated as a self-employed person. I would love to read a review of how you're going to handle them once you make the leap. It sounds scary. Yeah they are definitely complicated! They scare me but I have a pretty good handle on them so far. It seems that you have all the major points down. Good luck to you, but I know you will do well at being self-employed. My recent post We’re Separating – What Happens to Our Credit Card Debt? It definitely looks like you have your ducks lined in a row quite well. Can't wait to read how your switch goes! Man, I can’t begin to explain how much I wish I had come across this, or something like it, before I decided to branch out and start my own business. These are awesome tips that everyone should be taking a serious look into and internalizing, if they are interested in starting their own business endeavors. Still although I have already begun with my own, there are still a lot of things here that I can get started on now, so I’ll have to be sure to get on that. My blog has yet to make any money, until it does I don’t need to start actually putting money aside for taxes do I? and do you have a generic percentage of how much you put aside when you do make money, just to be sure all taxes are covered? Like 25% of your income for example? 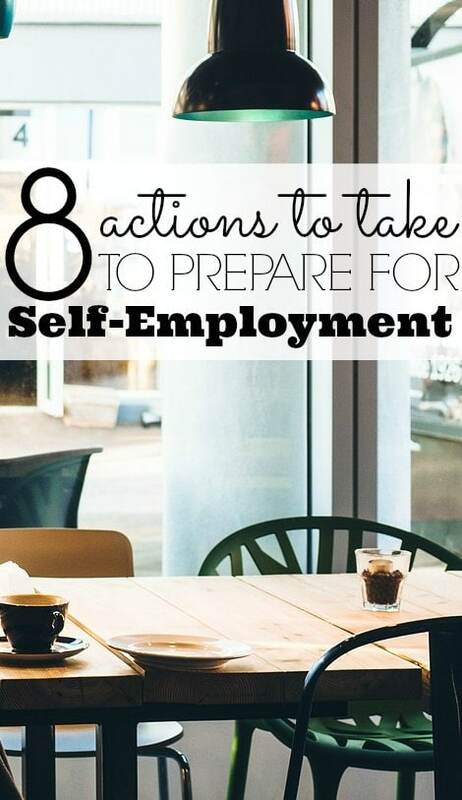 This is a great planning list for anyone moving to self-employment. Thanks for sharing. With health insurance, the choice often comes down to taking a less expensive plan with a high deductible, or facing high premium payments every month. I’ve found that keeping a separate bank account for quarterly tax payments works well. Whenever I receive a payment from a client, I automatically transfer funds (15 percent works for my wife and I) to that account. By doing that, money needed to pay taxes does not get co-mingled with other funds. For budgeting, it helps to look at how much money will be needed during the course of the year to cover various expenses. That offers the flexibility to roll with fluctuating monthly income levels. I’m prepping myself for self-employment now. I’ve been thinking about it for over a year, and it feels like it’s time. Sometimes, it’s the worst experiences in daytime employment that literally force you to start a side hustle. When you don’t see yourself 2o to 30 years from now working for that same narcissist employer, then you know it’s long overdue to start that online side hustle.